Oh boy! As I’m sitting here trying to type this post, I have to keep running into the bathroom. Not for me, but to help Parker because he has the flu and can’t seem to stop throwing up. Poor kid. I’m a wee bit nervous because last time he had the flu, he was kind enough to share it with me. Does anyone know of some good anti stomach flu juju? Anyway, with all the cookie recipes on my site, I realized the other day I have never posted a cut out sugar cookie recipe. Gasp! I love sugar cookies! I can never stop at just one, especially when they’re slathered in homemade buttercream frosting. 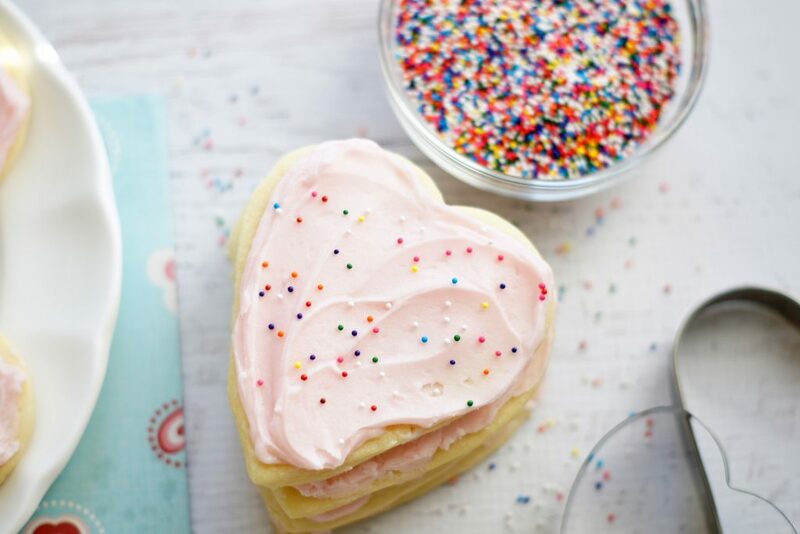 Valentines is the one holiday I always make sugar cookies, so with it being only a few days away, I’m finally sharing my favorite sugar cookie recipe. But before I do, I have a confession to make though. It’s been a few years since I’ve made homemade sugar cookies because we have fallen in love with the Betty Crocker Sugar Cookie Mix. It’s crazy good and the best part is I don’t even roll them out. I follow the “scoop” directions which makes them so fast to whip out. I actually had a friend ask me for my recipe after I took her a plate. I fessed up and told her it’s easy, you go to the store, buy a pouch of Betty Crocker Sugar Cookie Mix and follow the directions. This recipe I’m sharing today is one of my favorites. 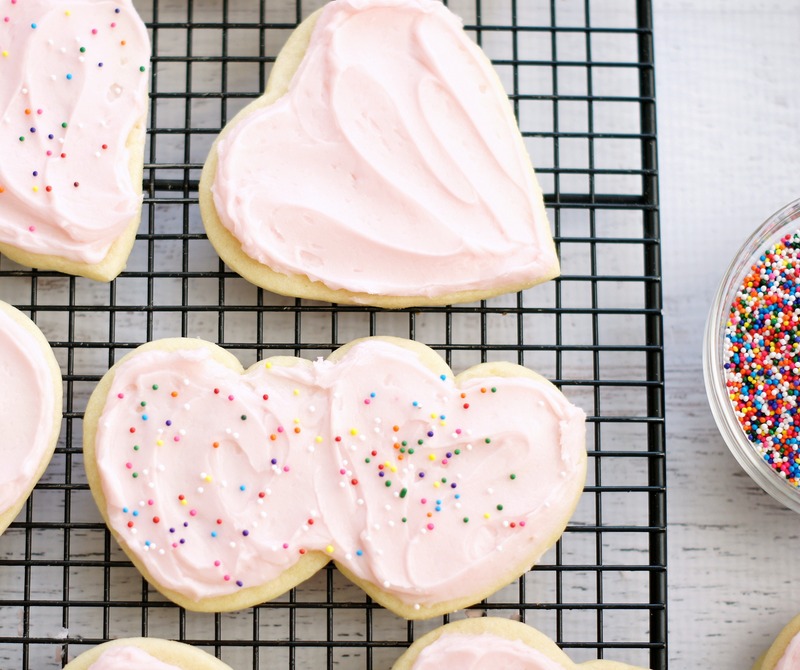 When I do make sugar cookies, it’s my go-to recipe. They are buttery, tender, soft and have just a little bit of a soft-crispy chewiness. It’s a little different than most sugar cookie doughs in that it uses mostly powdered sugar rather than granulated sugar which make a super tender, soft cookie. It also makes the dough so soft and almost velvety and really simple to work with. I think one of the reasons I love them so much is because they remind me of the beloved Betty Crocker sugar cookies. If you’re not a fan of almond, just trust me that it works in these cookies. The flavor is so subtle you honestly won’t even know it’s in there. It really just gives the cookies a rich flavor. Frost them with your favorite buttercream frosting, I’ve included my recipe below. These are so good. I won’t be surprised if they become your new favorite. These sugar cookies are truly amazing. Buttery, tender and so incredibly good. In bowl of an electric mixer, cream butter, sugars, extracts and eggs until light and fluffy (about 2 mins.). Add flour, baking soda, cream of tartar and salt. Mix until well combined. On a lightly floured counter, roll out 1/4" to 1/2" thick. Bake on lined cookie sheet for 10-12 minutes, or until bottoms just barely turn golden brown. They will look slightly underbaked. Cool and frost. In the bowl of an electric mixer, beat 2 cups of the powdered sugar, the butter, half-n-half, vanilla, and salt in the bowl until they are smooth and creamy, 2 to 3 minutes. Gradually add the remaining 1 1/2 cups powdered sugar and beat until the frosting is a good spreading consistency, scraping the sides and bottom of the bowl often (you made need to add more cream). Add food coloring if using. Mix well. This is so funny! Two years ago, my husband and I went to Nantucket Island for a summer weekend for my birthday. We stayed in a cute little place called the Ships Inn right in town and they had homemade breakfast every morning and cookies and lemonade every afternoon. Well, the chocolate chip cookies were the best I have ever had, so of course, I asked for the recipe. The innkeeper laughed and showed me the Betty Crocker chocolate chip cookie pouch. I never did buy a pouch, but we always laugh at that story–they were really great. Your cut-outs look amazing! I will have to try them. Teresa I love that story, that is so funny!! You just made my day! Betty Crocker certainly knows how to make good cookies! I hope you have a chance to make these, they are so, so good! I’m always looking for a good sugar cookie recipe, which is the reason I don’t have one on my blog. I guess I’m way too picky about sugar cookies. I love that this one has powdered sugar. I’m guessing that makes the cookies really soft. Plus, sprinkles! Jessica you will love these cookies. They are amazing and it’s really hard to eat just one. Hope you have a chance to make them. I have been the happy recipient of these cookies many a times and they really are the BEST sugar cookies! Maybe if I am really nice, I might find a plate on my doorstep on Valentine’s Day! Looks like a great recipe! I can’t wait to try them. I became ill last year with stomach problems (maybe IBS-D) and the thing that has helped me are probiotics. Not just any kind, but a combination of two. Florastor and Culturelle. We have good bacteria and bad bacteria in our stomach but when we get sick, the bad bacteria take over. Probiotics help to restore the good bacteria so that we can fight the sickness. 70% of our immune system resides in the gut, so it only makes sense to take something that will help our stomach, help us, to stay or get well. I had heard about probiotics from yogurt with live cultures, but after doing some research on the net I found out it would take TONS of yogurt to do anything at all. So I started researching the probiotics and found with my sickness, ( which included extreme diarrhea and nausea ) that the two probiotics I listed above would help me. I take them everyday now. I’m waiting for an app. in March with a Gastro doctor as I still have the severe problem, but the probiotics have cut all my systems in half. 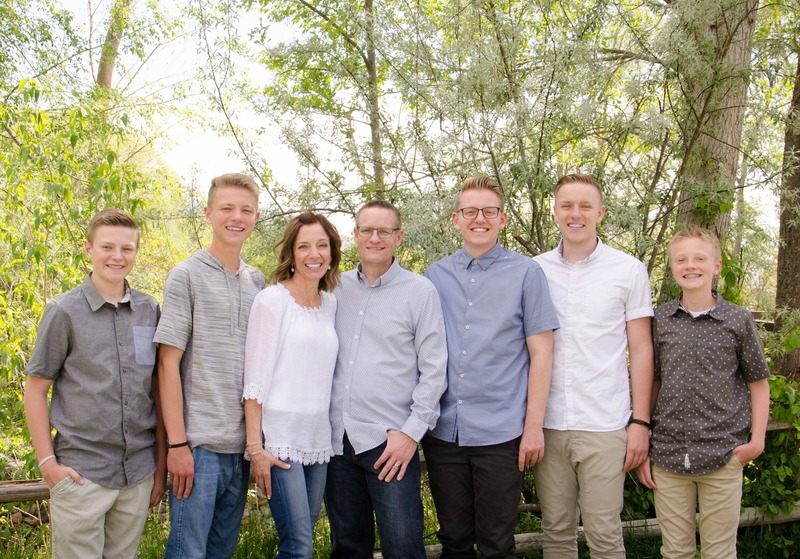 I don’t know what I would do without them! Doctors are just now starting to recommend them to patients, but I tell anyone who gets sick about them. They don’t have any side effects except for the first couple of days when you may notice some tummy rumbling as your system adjusts to them, and I would recommend them to anyone who wants to fight off sickness and boost their immune system. I will always take them from now on out. They even have fruit chewables for children. Sorry so long, but I hope this helps. You can buy them almost anywhere, Wal-Mart, Walgreens, CVS. I made these cookies for a teacher who is having chemotherapy and her family and of course there were some left for my own family! Cade took one (it was the last one) to school today and a few friends had a bite and he said everyone asked “where did you buy these cookies?” I guess that is a compliment, but to be honest, not much beats fresh baked goods baked in your own oven!! Anyway, Cade asked when I was going to make more!